Dr. Martin Czurda has vast experience in the banking sector having held executive and non-executive positions in various international banking institutions. Since June 2017 he is the CEO of the Hellenic Financial Stability Fund (HFSF) in Athens, Greece. Previously, Dr. Czurda was the Chairman of the Non-Executive Board at Swiss owned Valartis Bank AG, Austria appointed by a public trustee in order to sell the majority of the banking operations and wind up the remaining parts. 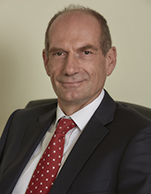 From 2013 to 2015, following the privatization of Austrian Anadi Bank AG (formerly Hypo Alpe-Adria-Bank AG) he has served as the Chief Executive Officer (CEO) for the new owners from India and UK. During this time, he reorganized the bank and transformed it from a non-viable credit institution to a private profitable bank. He has also served as restructuring Chief Risk Officer (CRO) and Chief Financial Officer (CFO) at a Slovene bank in Vienna in 2012-2013, and from 2009 to 2012 he has been appointed CEO at Amsterdam Trade Bank, a Russian/Dutch bank in Amsterdam, with the mission to change the previous business model into a trade and commodity finance bank profiting from the trade flows between Russia/CIS and Europe. In the past he has acted as Non-Executive member in many organizations on the Board of Directors such as Austrian Hypo (Mortgage) Association, SREI Infrastructure Ltd, Amsterdam Trade Bank and RCB. Has also served as Managing Director (MD), Division Head of Global Markets and Division Head of Financial Institutions at Raiffeisen Zentralbank, Vienna and started his commercial banking career with Bank Austria, Vienna. Martin Czurda was born in Vienna, Austria, holds a Doctorate Degree (Dr.) in Economics and a Master's Degree (M.A.) in Business Administrations from the University of Economics, Vienna, Austria.